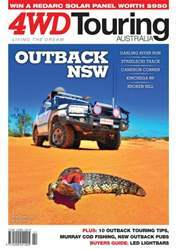 4WD Touring Australia – Issue 22. The NSW Outback is channel country, vast ochre plains and lonely dunes. It is Australia in microcosm. From the Darling River's arrow-straight swath across the state to the badlands of the corner country and the mining megapolis of Broken Hill, this is the real outback, a place where people have forged a tenuous link with an ancient land. Check out our features on the Darling River Run, Strzelecki Track, Corner Country, Kinchega NP and Broken Hill. Catch you out there one day, Living the Dream.